Like so many children Zane is on the Autism Spectrum and while their issues might seem unreasonable and even be unfathomable to those around them, like Zane’s fear of black frustrates and angers his father, nevertheless they are very real to the child. And because of the way their brain is wired they can’t overcome them any more than we can expect them to change their hair colour or foot size, so it is up to us as adults to adapt our way of thinking and working so we can enable the child to manage the world better. It’s about acknowledging their disorder and treating them with respect and dignity. If they can’t change then we must. Through imagination and love, the rainbow bridges work for Zane’s family and instead of being frustrated even his dad is able to free Zane from the prison walls of black. Kids themselves are very accepting of others whatever their differences, but they don’t always understand how their actions can help or hinder. Nearly every classroom had a child with ASD these days and while that child’s issues might not be the colour black, using this book as a springboard to introduce how peers can help the ASD child have a better time at school would be a brilliant start towards total acceptance and understanding. 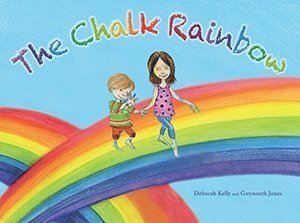 Even if there is no ASD involved, using the imagination to make something like a chalk rainbow to take that next step into the unknown is a wonderful strategy. An essential addition to the school library’s collection and the home library of the siblings of an ASD child. This entry was posted on June 23, 2017, in Belonging, Disability, Emotions and Feelings, Family Stories, Imagination, Picture Book, Review, Special Needs, Teaching Resource.